Switzerland - IOM reports that 25,170 migrants and refugees entered Europe by sea in 2017 through 22 March, with over 80 percent arriving in Italy and the rest in Spain and Greece. This compares with 163,273 through the first 82 days of 2016. IOM Rome spokesman Flavio Di Giacomo said Thursday between 20 and 22 March, 4,380 migrants arrived in Italy by sea. On 23 March another 1,200 migrants who were rescued in recent days also were brought to land. 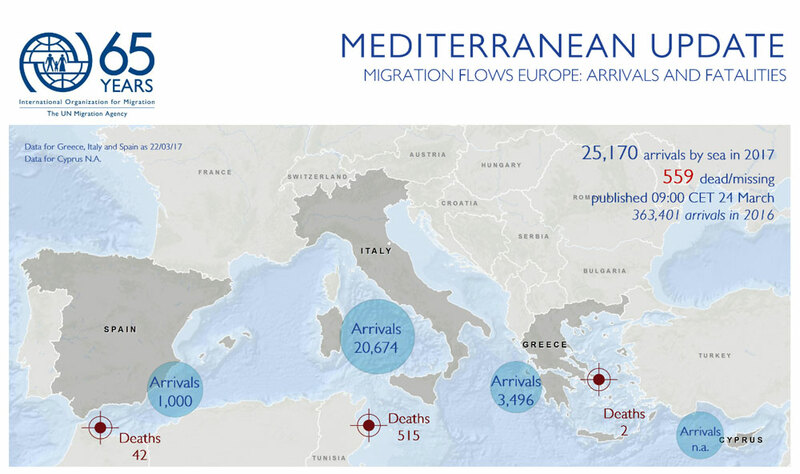 They are not yet included in the 20,674 total arrivals figure compiled by Italy’s Ministry of Interior to date. The main nationalities included with these 1,200 additional arrivals are Nigerian, Gambian, Ivorian, Ghanaian, Malian, Senegalese and Guinean (both Guinea-Bissau and Conakry). Di Giacomo further reported that on Thursday the NGO Proactiva Open Arms retrieved the remains of five migrants from a capsized dinghy. These five deaths are not included in the 559 Mediterranean migrant and refugee fatalities recorded by IOM’s Missing Migrants Project through March 22. Last year at this time IOM recorded 554 Mediterranean fatalities, two thirds of those occurring off Greece in the Eastern Mediterranean. In 2017 so far only two fatalities have been recorded on this route. By contrast, nearly 560 of this year’s reported deaths have occurred on the routes to Italy and Spain – or about three times the combined 188 fatalities recorded on these two routes in 2016. Worldwide, Missing Migrants reports fatalities on this date top 1,050 (see chart, below), with the Mediterranean region accounting for the largest proportion of deaths – over half of the global total. As of March 23, Missing Migrants Project has recorded 20,157 migrant deaths since the start of 2014 – or over 20,000 migrant deaths recorded in just over three years. “This figure is especially troubling, considering that Missing Migrants Project data is a minimum estimate of the real number of deaths during migration worldwide, and it is likely that many more deaths go unrecorded,” said Julia Black of IOM’s GMDAC unit in Berlin, which compiles the Missing Migrants database.